On Amber LaBau's blog today I give a few beyond the basics tips for scrapbooking on the go. For as much as I love digi scrapping - sometimes life gets in the way and I do not get all the time I want in front of my computer screen. However I always have my cellphone with me and I find that I can get a lot prepped and finish up layouts when I do actually have time to get in front of my PC. First and foremost - the best way I have found to be able to transfer and use photos between devices is to use Dropbox. Dropbox is a cloud based document storage platform - and you can sync between multiple devices automatically. I also use as 1 of my cloud storage systems for my phone photos - its automatic and reliable. Photos are copied to a folder on my PC and then I can organize from there. I do pay for extended time for my deleted photos (1 year versus 1 month - and yes I have had to use it!) as well as extra storage since I save all of my current kits in Dropbox for ease of use. I currently have 1TB of storage. Dropbox is available on iOS and Android. The next most important tool in my arsenal is Becky Higgins Project Life app. This app is also available on iOS and Android. Although there are other similar programs ( Rhonna Designs and many collage apps which are also excellent..) - the ease of using of this app has changed my on the go scrapping in so many ways! Introduced in fall of 2014 there have been many improvements over the last 2.5 years. Many weeks I only take pictures on my phone so having the app is an excellent way of keeping up with documenting my year. There are many kits built into the app - but even better is that by using Dropbox you can use cards from any kit - especially adorable ones like Amber's! There are lots of tutorials on Becky's website and YouTube that can help you get started if you are not familiar with the app. There are many different templates available - you can even use very large photos. You can export to print individual pages or into photobooks. The next tool in my arsenal of beyond basic apps is Pic-Tap-Go. There are many great basic photo editing apps built in all phones (and they get better with every version) but I like have the ability to have multiple layers of editing available. Although this is only available in iOS - a very comparable product for Android users is Snapseed. There are many, many photo editing options available but I have found these to both be very consistent - and they also leave your original uneditted version in your camera roll in case you want to use it in a different way - for example using a color version and black & white version of the same photo on separate layouts - or even the same layout. One of the only drawbacks if you want to add some artisitic touches is that you cannot add all the extra embellishments in Project Life etc. That is where Over comes in. It allows you to add text over your images, add png's - even mat your layout with a piece of patterned paper. Over is developed in part by Adobe (the makers of Photoshop an Photoshop Elements) so they understand the digi scrappers workflow better than most. In this app you can upload fonts, add .png's and word art that is built into the app. You can also add dropshadows (and control what they look like) on elements that you import in the app. Over is available for iOS and Android. Now for the fun part - let me share some examples of beyond the basics in app scrapping. 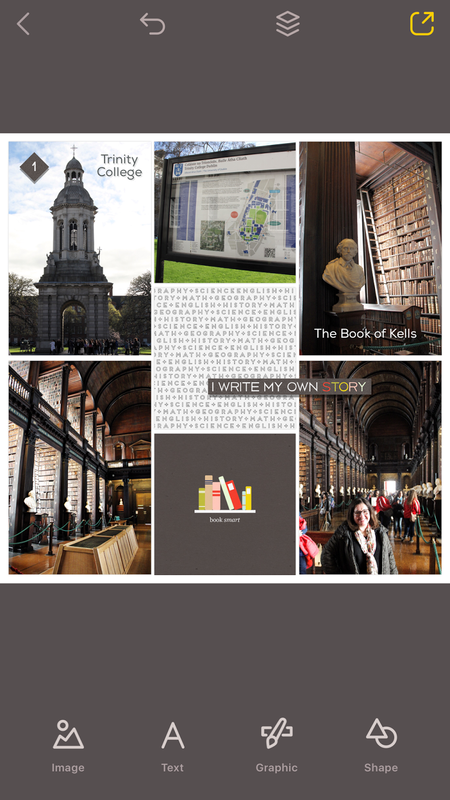 In this case I am happily scrapping my photos from my Ireland trip! I just got back last week so all the memories are fresh and I am excited to be documenting them quickly! That is the best part of using apps – is that you can even scrap on the go – in the car/bus/plane etc. while the memories are still so vivid! In the app, you pick a pocket and insert either a photo or a card. In the case of using a kit outside of the app, you will insert as a photo. There are lots of options in which file to select your photo from –not only your Camera Roll or Dropbox – but from several other apps including PicScanner, PicStitch, Pic-Tap-Go and lots of social media platforms – and it seems like new ones get added all the time. Then start adding different cards and photos and see what works for your page design.. In this case I went through a few different layouts until I liked where I was. Within the app you can also edit photos – in case you hadn’t already edited the photos. There are basic edits as well as access to full Pic-Tap-Go editing tools. Now that my photos and cards are where I want - I can add the other embellishments. After you are done – you have many options to export your “completed” albums. Since I wanted to add extra embellishments I imported it to Over. Saved back to Dropbox for printing! There you have it – from start to finish using some of the beyond the basic apps. I hope you enjoyed this tutorial – please let me know if you have any specific questions or want me to go more in depth on one aspect.